pimples. External irritants may also cause an allergic skin reaction that produces redness, swelling, or blistering. The mucous membranes of the eyes, nose, mouth, and throat are also quite sensitive to chemicals. Pesticide exposure may cause stinging and swelling in these membranes. Internal injuries also may occur if a pesticide is swallowed, inhaled, or absorbed through the skin or eyes. Symptoms vary from organ to organ. 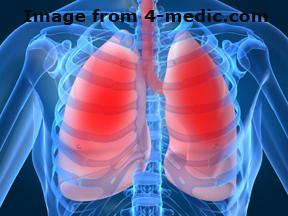 Lung injury may result in shortness of breath, drooling (heavy salivation), or rapid breathing. Direct injury to the stomach and intestines may produce nausea, vomiting, abdominal cramps, or diarrhea. Injury to the nervous system may cause excessive fatigue, sleepiness, headache, muscle twitching, and numbness. In general, different types of pesticides produce different sets of symptoms. If someone develops symptoms after working with pesticides, seek medical help immediately to determine if the symptoms are pesticide related. In certain cases, blood or urine should be collected for analysis, or other specific exposure tests can be made. It is better to be too cautious than too late. Try to determine what the victim was exposed to and what part of the body was affected. –The appropriate first aid treatment depends on the kind of exposure that has occurred. Take action, give first aid- taking the right action is as important as taking immediate action. If the person is unconscious, having trouble breathing, or having convulsions, ACT FAST! Give needed first aid immediately. Call 911 or your local emergency service. If possible, have someone else call for emergency help while you give first aid. Have the pesticide label on hand. If the person is awake or conscious, not having trouble breathing, and not having convulsions, read the label for first aid (or Statement of Practical Treatment) instructions. Call the poison center at 1-800-222-1222. Ingestion (swallowed). Accidental oral exposure can occur when children have access to baits or other improperly stored pesticides in the home, when pesticides have been put into an unlabeled bottle or food container, or when you do not wash your hands and face before eating, drinking, or smoking after application. Many pesti­cides are rapidly and completely absorbed by the intestinal tract causing illness and internal damage. 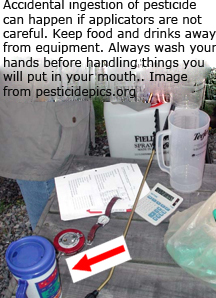 A conscious victim should drink a small amount of water to dilute the pesticide. Induce vomiting only if a poison center or physician advises you to do so. Skin contact. 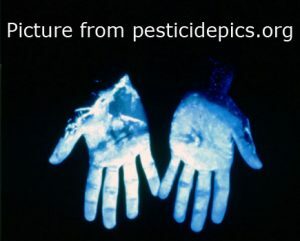 Evidence indicates that about 97 percent of all body exposure to pesticides during a spraying operation is by skin contact. Parts of the body differ in their ability to absorb pesticides. Warm, moist areas such as the groin, armpits, head, neck, backs of hands, and tops of the feet tend to absorb more than the palms and forearms. Cuts, abrasions, sunburns and skin rashes can increase absorption as well. Drench skin with water for at least 15 minutes. If the skin appears burned, do not apply ointments, greases, powders, or other drugs.Cover the burned area immediately with loose, clean, soft cloth after drenching. Wash skin and hair thoroughly with soap and water. Later, discard contaminated clothing or thoroughly wash it separately from other laundry. Inhalation. If inhaled in sufficient amounts, pes­ticides can cause contact damage to nose, throat, and lung tissue. Once breathed into the lungs, pesticides can enter the bloodstream very rapidly and completely, eventually resulting in damage to other body organs (systemic illness). If the victim is outside, move or carry the victim away from the area where pesticides were recently applied. If the victim is inside, carry or move the victim to fresh air immediately. If you think you need protection like a respirator before helping the victim, call 911 and wait for emergency equipment before entering the area. Loosen the victim’s tight clothing. If the victim’s skin is blue or the victim has stopped breathing, give artificial respiration (if you know how) and call 911 for help. Open doors and windows so no one else will be poisoned by fumes. Eye Contact. Although eyes are small, especially when compared to the volume of skin, they can absorb a large of amount of chemical and very quickly. Eyes may also be very sensitive to certain pesticides. Some pesticides when absorbed by the eyes can be corrosive and cause irreversible damage. If pesticide gets into the eyes, hold the eye lids open and immediately begin flushing with clean water. Do not use chemicals or drops unless instructed to by a physician or poison control center. Cover the eye with a clean piece of cloth and seek medical attention immediately. First aid may precede but should not replace professional medical treatment. After giving first aid, call the emergency number listed on the label, and or the poison center at 1-800-222-1222. Have the pesticide label at hand when you call. If emergency treatment is needed in a doctor’s office or emergency room, carry the container in your trunk or flatbed away from the passengers in your vehicle. The doctor needs to know what active ingredient is in the pesticide before prescribing treatment. This information is on the label, which sometimes also includes a telephone number to call for additional treatment information. The National Pesticide Information Center, NPIC, provides information on pesticides and how to recognize and respond to pesticide poisonings. Call NPIC toll free at 1-800-858-7378. The service operates seven days a week, from 6:30 a.m. – 4:30 p.m. Pacific Time (9:30 a.m. – 7:30 p.m. Eastern Time). If necessary, staff at NPIC can transfer your call directly to a local poison center. NPIC staff answer questions about animal exposures, too. To keep your pets from being poisoned, follow label directions on flea and tick products carefully, and keep all pesticide containers and rodenticide baits, out of reach of pets. If you have questions about the chemicals used in flea and tick products, consult your veterinarian or the pesticide manufacturer. Symptoms of Pesticide Poisoning. Aug. 1996. Bruce Paulsrud. University of Illinois Extenion. Fact Sheets and other Pesticide Information from Illinois Pesticide Safety Education. Potential Health Effects of Pesticides. 2007. Eric Lorenz. Penn State University. Pesticide safety fact sheets, Consumer topics, Applicator topics and West Nile Virus fact sheets provided by Penn State to help with pesticide education. Toxicity of Pesticides. 2006. Eric Lorenz. Penn State University. Pesticide safety fact sheets, Consumer topics, Applicator topics and West Nile Virus fact sheets provided by Penn State to help with pesticide education. Pesticide Chemical Fact Sheets. Oct. 2007. U.S. Environmental Protection Agency. Government fact sheets on preventing the harmful use of pesticides. Pesticide Information Profiles. Oregon State University. Search and browse through EXTOXNET, Pesticide Information Profiles. Allows you to search for any pesticide-related information, bringing up search results from various website articles written by professionals.